The lovely ladies from the Gabriel Series Podcast joined us live and via a written message sent by Perling. Betty was in the house and she stayed until the end of the year countdown. You can join them on Mixlr live every Sunday, for more info you can go here. My name is Perling. I’m from Venezuela. My name is Betty. I’m from USA. And we are the Podcasters of the Gabriel Series Fan Podcast. 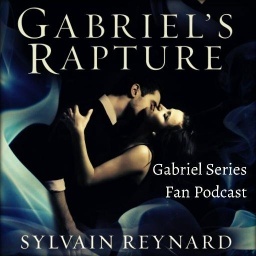 Our podcast is a place where readers can discuss the Gabriel Series written by Sylvain Reynard. We started our podcast with Gabriel’s Inferno and now we’re reading Gabriel’s Rapture. When did you find Sylvain Reynard’s books? Perling: I found the books because of Erika (The author of the Fifty Shades). She tweeted about reading Gabriel’s Redemption and then the name caught my attention and I looked for the author. And voilà! Betty: Perling and I became friends through the Fifty Shades Fan Podcast. One day Perling and I were chatting and she suggested I read Gabriel’s Inferno by Sylvain Reynard. And after finishing the book Perling suggested I say hello to Sylvain Reynard. And after that the rest is history. What do you enjoy the most of the show? Why should people listen to the podcast? Perling: Because we’re awesome. (Giggles… I’m kidding.) Because we enjoy reading the books. Because I think the story of these books deserved to be shared with others who love the storyline. And because it was frustrating for me reading the books and not having someone to discuss it when I was reading it. Betty: It’s a fun show. We love interacting with the Boss’s readers. They’re funny. We love reading their favorite quotes along with the Boss’s. And we learn a lot about art while reading the books. Do you have a special Christmas message you want to share? Betty: We want to thank our Boss. This podcast wouldn’t be possible without him. Thanks to his suggestion and all your support, we started our journey. It’s been an unforgettable year for the both of us. We hope this holiday season is filled with many blessing for each and every one of you. May the new year bring you peace and love. Happy holidays!